Collagen is a protein fiber created by the human body. This protein is used in many ways throughout body systems. It is most importantly utilized to keep all the organs in the body connected. Not only does it aid in supporting bodily organs and in connective tissues, but it also plays a large role in the body's healing process. As the body ages, collagen production slows, which is why ligaments and tendons become weak. Collagen has a hard enough time producing itself because of the limited blood flow to the structures, but factor in aging and it becomes worse. The elasticity and flexibility of the collagen allows it to sufficiently hold together muscles to bones, and bones to bones without wearing out. In elastic ligaments, the elastic material consists of thick fibers interspersed with collagen fibers. It is naturally produced by the body, but can also be taken into the body through outer food sources. This will help support the skin and other internal organs. For example, by adding mineral crystals to the body's collagen, it will help make up bones and teeth. Their fibres will also weave together and form a network of new cells that will grow and reproduce. 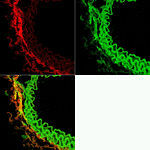 A blood vessel containing collagen (colored red) and elastin (colored green). Collagen makes up the connective tissues in ligaments (connection of bone-to-bone) and tendons (connection of bones-to-muscles). 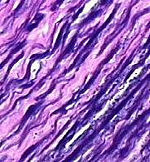 It is the fascia that covers the muscles and joint capsule tissues. This fibrous structural protein makes up the white fibres of the skin, tendon, bone, cartilage, and other connective tissue. It is the body's natural protein that composes most of its structural support, holding the body together. It is present in every multicellular organism and gives organs and tissues their strength and elasticity. It makes up about 25% of dry protein weight in the human body, 75% of the body's skin, and overall 35% of the entire human body. Fourteen different collagen varieties help form several body parts. It appears in, not only tendons and ligaments, but in joints, muscles, hair, skin, and other vital organs. Rebuilding Collagen: The Key to Prolotherapy Marc Darrow, M.D. Collagen Injections Einstein Industries, Inc. This page was last modified on 24 July 2014, at 18:39.